For the Lord himself shall descend from heaven with a shout, with the voice of the archangel. It seems clear that the Lord Jesus Christ is following the Jewish Wedding scenario in his dealings with his Bride, the Church. The Church is his body, the collection of all true Christian believers. We are cells in his body just as we have cells in our own bodies. 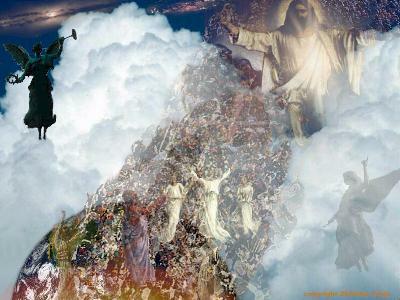 This makes extremely strong evidence the Rapture, which is the departure of the Church, comes prior to the Tribulation. 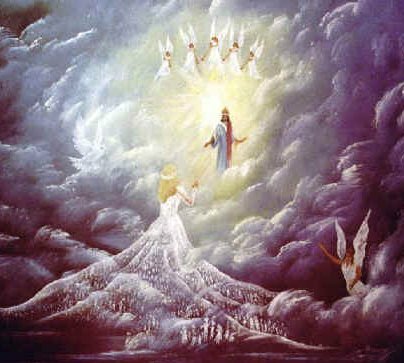 This is because Jesus takes his bride to heaven while the Tribulation takes place on earth. Thus, the Rapture, is often called the “Blessed Hope.” Jesus' words in John 14 below show this exact scenario. The Tribulation is a time of great trouble on earth, understood to last 7 years, and also known as the time of "Jacob's Trouble." This viewpoint is known as the Pre-Trib Rapture view. Jesus said, Let not your heart be troubled: ye believe in God, believe also in me. In my Father's house are many mansions: if it were not so, I would have told you. I go to prepare a place for you. And if I go and prepare a place for you, I will come again, and receive you unto myself; that where I am, there ye may be also (New Testament book of John 14:1-3). 1. Betrothal: In Jesus’ day the groom usually contracted for the bride and a purchase price negotiated. Jesus has paid the price for us. This establishes the marriage covenant. The betrothal benediction was pronounced and the bride and groom shared a cup of wine as symbol of the covenant. 2. Preparation: Then the groom would leave for his father’s house. Both the bride and groom had specific things to prepare. The groom had to prepare the living area and furnishings. The bride would prepare her dress and other personal items. Her mother would instruct her in marital skills. Jesus has gone to his father’s house in heaven to prepare a place for us, and he will return to take us there. 3. Groom returns for the bride: The groom and his friends formed a procession usually at night with lighted torches. This would proceed through town so the townspeople would be aware of the wedding. The bride would not know the time of the grooms return. She would need to be always prepared and ready. We must be all set for our Lord’s return. 4. Consummation of the Marriage: The wedding party would then make the trip back to the groom’s father’s home where the rest of the activities would take place. The consummation of the marriage takes place immediately after arrival at the Father’s home. 5. Wedding Feast and Seven Day Huppah: The wedding feast begins right after the consummation and is known as the “huppah.” This lasts 7 days. Monk, the author, thinks this symbolizes the 7 year tribulation period. In the following passage Jesus tells just how terrible the Great Tribulation will be. So it is indeed the “Blessed Hope” for his body (the collection) of all true believers in Jesus Christ, the Church, to be evacuated beforehand. Then shall they deliver you up to be afflicted, and shall kill you: and ye shall be hated of all nations for my name's sake. And then shall many be offended, and shall betray one another, and shall hate one another. And many false prophets shall rise, and shall deceive many. And because iniquity shall abound, the love of many shall wax cold. 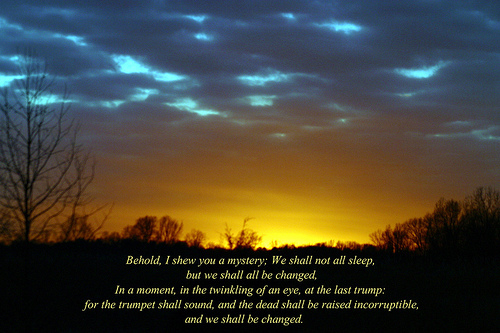 But he that shall endure unto the end, the same shall be saved. And this gospel of the kingdom shall be preached in all the world for a witness unto all nations; and then shall the end come. -- Matthew 24. For then shall be great tribulation, such as was not since the beginning of the world to this time, no, nor ever shall be. And except those days should be shortened, there should no flesh be saved: but for the elect's sake those days shall be shortened. Then if any man shall say unto you, Lo, here is Christ, or there; believe it not. For there shall arise false Christs, and false prophets, and shall shew great signs and wonders; insomuch that, if it were possible, they shall deceive the very elect. -- Matthew 24:1-24. 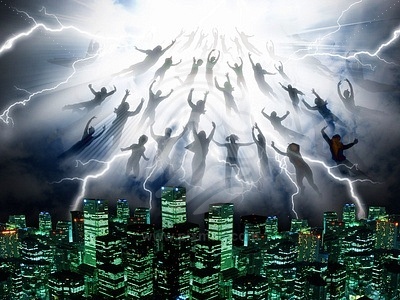 The following passage is one of two that speak of the time believers will be caught up together in the clouds, to meet the Lord in the air: Notice that the Lord signals his arrival with a SHOUT. This is the SAME thing the Jewish Bridegroom did to announce his arrival at the Bride’s house with his wedding procession. You may wonder where the people in the Lord’s wedding party come from. I will answer that in a later paragraph. The passage below is the other passage speaking of the Rapture, or translation of the Church. The word “sleep” in the passages, both, above and below, is a Biblical term for death. Nobody actually dies, because all souls live forever. After Christ’s death on the cross: And the graves were opened; and many bodies of the saints which slept arose, and came out of the graves after his resurrection, and went into the holy city, and appeared unto many. Now when the centurion, and they that were with him, watching Jesus, saw the earthquake, and those things that were done, they feared greatly, saying, Truly this was the Son of God (Mt 27). I believe this involved a token resurrection in accord with the Jewish Feast of First Fruits. This would be the source of the Lord’s entourage at his coming in the Rapture. 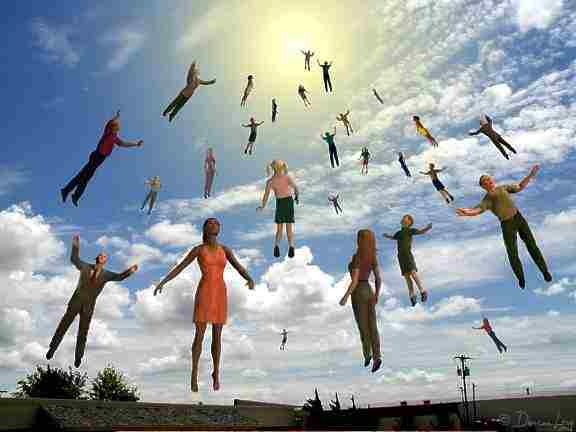 Believe on the Lord Jesus Christ and you will be saved (Acts 16) AND RAPTURED TOO.